Once a year I make tarts for the Horticultural Society Soup and Sandwich lunch and make enough extra for Cliff’s Plumbing and home. This year it worked out particularly well because I thought I need to update the butter tart photo on my blog to a gluten-free version and this gave me the opportunity. 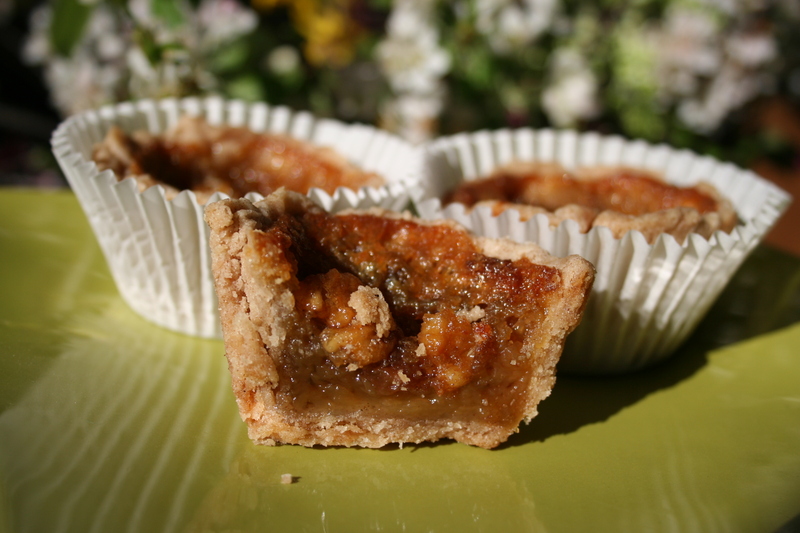 I recall counting butter tarts as one of the blessings that was naturally gluten-free when I first began my diet. I do not indulge often but it is good to know I can still add them to a special picnic or camping trip when I want to and they are just as decadently delicious as always! Mix brown sugar, salt, melted butter and corn syrup. Whisk eggs then stir into brown sugar mixture being careful not to beat. If you get too much air in the mixture some of the tarts may seem hollow when baked. Place raisins, nuts, coconut or a mixture of these in the tart shells then cover with butter tart filling to 3/4 full with a 7/8 oz scoop if you have one. for another 15 – 20 minutes or until filling is set. If you like your tarts runny you may take them out a little early or reduce the number of eggs to 3. *I would not substitute margarine here. This entry was posted in Gluten-free Adaptations and tagged Anne's Favourites, butter tarts, celiac, comfort food, Delicious, gluten-free, naturally gluten-free by Anne's Favourites. Bookmark the permalink.